Recently I wrote about the most beautiful women in the world according to AskMen, Forbes, Premiere and other magazines that have invoked hundreds of comments. The public has implicitly proved that in the world of immaculate fashion models, famous actors and celebrities, beauty still remains a relative concept. In my post today I’d like to speak about some non-classic forms of beauty that once existed or still have a place in some countries. I’m sure that some of them will turn out to be a real surprise. So let’s start. To be a fashion-monger in ancient Egypt you would have to be bald-headed! The beautiful shape of the skull was one of the forms of beauty. Those days if your skull was not so perfectly shaped to boast, you would have to wear a lace from wool and flax. To be beautiful in Ancient Rome you would have to be a blond. (That’s where it all started!) Girls were thoroughly dyeing their hair with various substances trying to reach the needed effect. Since some of the colorants were poisonous, at the end you could have ended up being bald instead of blond. 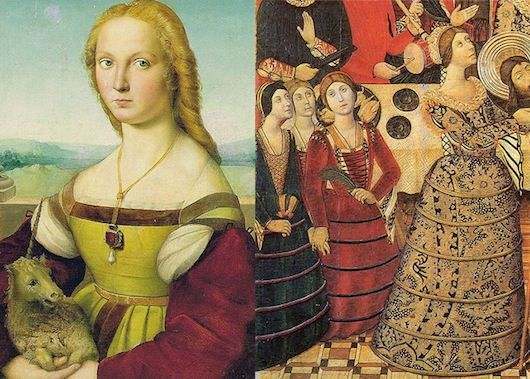 Medieval ladies had to wear tight corsets from early childhood. By adulthood they looked like they were suffering from rachitis also known as rickets. The other fashion trend was the big size of the pupil. Believe it or not, women were instilling the juice of belladonna into the eyes. (Most of you might know that it’s a poisonous plant containing atropine). By the way, “belladonna” means “beautiful women” in Italian. Blond hair was still fashionable as well, but there was a slight problem. It was considered unworthy for devout, pious ladies to use colorants. So they spent hours bleaching their natural hair color under the scorching sun’s rays that often resulted in sunstroke. The Spain of the XV century was too over-virtuous. Hard to imagine, but this was the period when it was improper to have outstanding “female shapes”. Young girls were bound with special chest plates to keep their breast from growing. Women’s dresses resembled a dull shell, and even the tips of shoes had to be hidden under the skirt. The Italian Renaissance was more lenient to the human body. It had nothing against natural body proportions and even went further. The ladies of that time should have been strong and sturdy, with broad shoulders and muscular forearms. 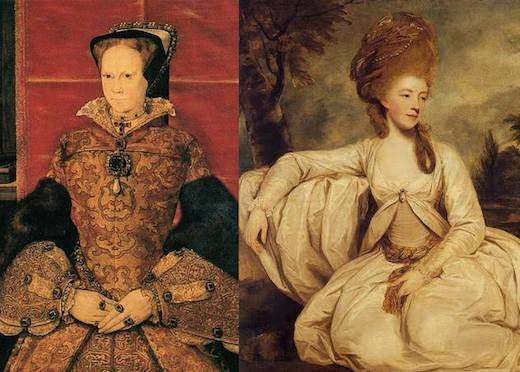 At the same time, high foreheads were in fashion, so the ladies not only trimmed the hair, but fully removed the eyebrows as well. The XVII century was a golden time! It was fashionable to be fat: the fatter you are – the better. Plump woman blossoming with health embodied the idea of abundance, fertility and motherhood. All of us might have seen the paintings created by artists of that time, who portrayed plump elephantine female bodies with lush hips and bumps of cellulite. The XVIII century is the century of the coiffure. (More about it in my post here). The heavy bundles of feathers, fruits, ships and other arrangements set on the head were a real nightmare. Since the coiffure took a very long time to create, you would have to wear it on your head for at least a few days and sleep on a special neck pillow. Image how difficult simple hygiene would be! The XIX century brought its own beauty laws. The thin and pale girls with a melancholy expression on their faces and unhealthy flush on their cheeks were admired. It was very unworthy for a decent girl of that time to use make-up, so they drank vinegar to achieve the pallor effect and ate lots of sweets and strawberries that caused allergic red spots on their cheeks. This was also the time when the first guides on how to stay on a diet appeared. If you were a fleshy women, you were not if favor any longer. 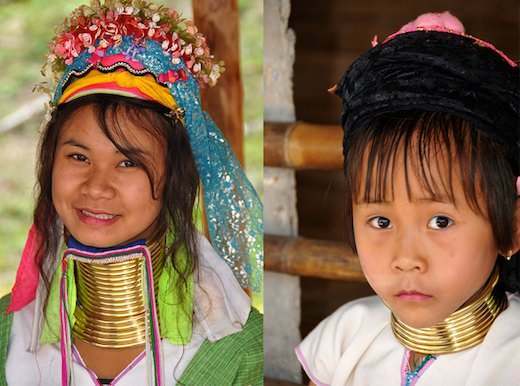 The Red Karens tribe somewhere between Burma and Thailand have a very special women’s beauty model: long necks. The more copper rings the woman wears on her neck, the more attractive she is considered to be. Without the rings the woman is sure to die though. Men of the Maasai tribe think that the real beauty is in the … ears. Well not exactly the ears, but the size of the hole in the earlobe. So Maasai girls strive to keep their earlobes as stretched out as possible. 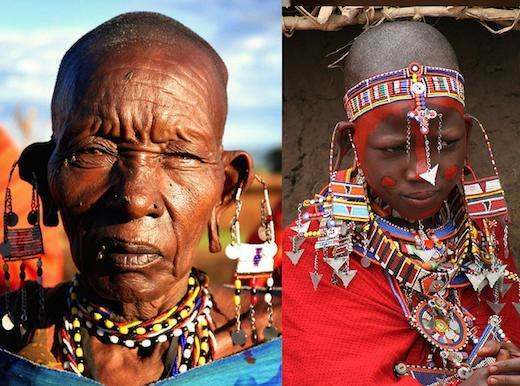 The most glorious Maasai female has no two front teeth, and most of her head is shaved bald. 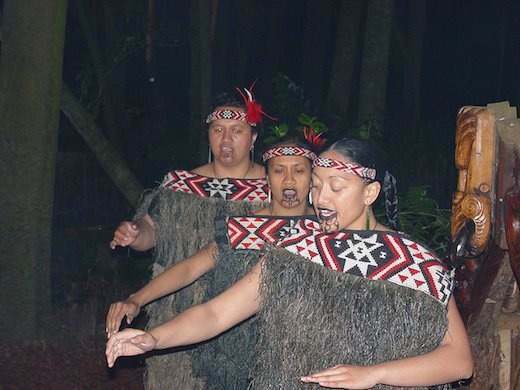 Maori people (the natives of New Zealand) believe the beauty of their women is enhanced by tattoos. They sincerely believe that the women of their tribe look better when their lips and chins are covered with tattoos. The more ink that has been injected into the lips of a Polynesian bride, the more attractive the girl is. While the women of the Western world seek to lose weight by all possible means, the thicker you are in Mauritania, the more beautiful. The more the Moorish bride weighs, the more desirable she is. If you happen to see a dark-skinned woman with a clay plate in her lower lip, then you know you’ve met Mursi. This tribe lives in Ethiopia and their beauty standards can be considered cruel by Western society. Labial plates can reach 15 cm in diameter, and the larger the decoration is, the more beautiful the woman is! So, has your definition of beauty changed? Tell us what you think of “beauty” in the comments below!